Napoleon Bonaparte had two wives: Josephine (Rose de Beauharnais) and Archduchess Marie Louise of Austria. What did they think of each other? Josephine was born in Martinique on June 23, 1763 as Marie Josèphe Rose Tascher de La Pagerie. Her first husband, Alexandre de Beauharnais, was guillotined during the Reign of Terror. Josephine married Napoleon on March 9, 1796, when she was 32 and he was 26. 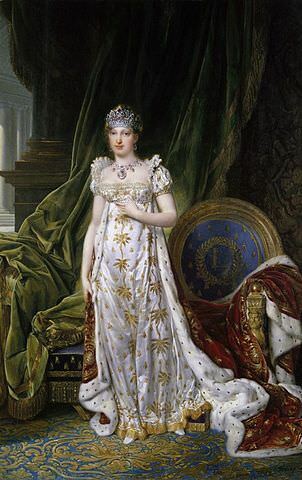 Though Josephine already had two children (Eugène and Hortense) from her first marriage, she was unable to produce an heir for Napoleon, a matter that troubled him once he became Emperor of France. On December 16, 1809, Napoleon had the marriage dissolved, much to Josephine’s regret. 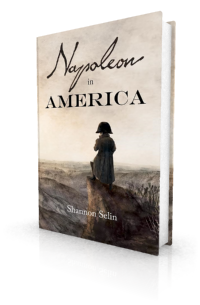 Napoleon had already been casting about the royal houses of Europe for a new, fertile wife. He settled on Marie Louise, the eldest child of Emperor Francis I of Austria, head of the House of Habsburg. They were married in Vienna on March 11, 1810. Napoleon – who had never seen Marie Louise – was in Paris at the time, so the bride’s uncle, Archduke Charles, stood in as Napoleon’s proxy. Marie Louise was conducted in triumph to France, where civil and religious marriage ceremonies were held on April 1 and 2. Since Josephine’s home at Malmaison was very near Paris, Napoleon gave his ex-wife the Château de Navarre near Évreux, some 50 miles away, with the understanding she would stay there and avoid the marriage celebrations. Josephine also wrote to Marie Louise from Navarre. While Josephine was willing to cultivate cordial relations with Marie Louise, the latter was not about to reciprocate. Marie Louise (b. December 12, 1791) was only 18 when she married Napoleon (he was then 40), and she was jealous of her predecessor. Though Napoleon hoped he could introduce his two wives, it was not to be. 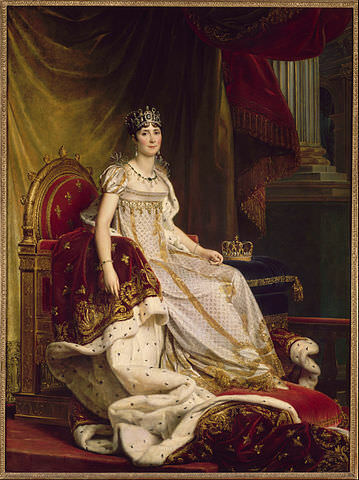 Marie Louise’s anxiety made it hard for Napoleon to accede to Josephine’s wish to see his son. The meeting took place in secret, at the Château de Bagatelle, a small royal palace in the Bois de Boulogne near Paris. Madame de Montesquiou, the King of Rome’s governess, brought the young prince. Josephine died on May 29, 1814, at the age of 50, when Napoleon was in exile on Elba. Marie Louise outlived both Napoleon, who died in 1821, and their son, who died in 1832. She died on December 17, 1847, at the age of 56. Click here to see a photo of Marie Louise taken earlier that year. John S.C. Abbott, Confidential Correspondence of the Emperor Napoleon and the Empress Josephine (New York, 1856), pp. 306-307. Emmanuel de Las Cases, Memoriale de Sainte Hélène: Journal of the Private Life and Conversations of the Emperor Napoleon at Saint Helena, Vol. II, Part 3 (London, 1823), pp. 303-304. Claude-François de Méneval, Napoléon et Marie-Louise: Souvenirs Historiques de M. Le Baron Méneval (Paris, 1843), Vol. I, p. 323. A beautiful and sensitive blog Shannon, thank you. Thanks, Lally. I’m glad you liked it. How true, Lona! Pretty much every 19th-century letter I’ve come across seems eloquent compared to today’s communications. Very beautiful. I’m a little late on my History Lessons. But it’s an honor to help in communication in any way I can. Most interesting Shannon. A subject I had never thought of and you have provided a good few races that I wasn’t aware of. You’re welcome, Paul. I’m glad you enjoyed the article. I cannot ask more than a place in your affection far removed from that occupied by the Empress Maria Louisa.